Because of the flammability of terpene, fatwood is prized for use as kindling in starting fires. It lights quickly even when wet, is very wind resistant, and burns hot enough to light larger pieces of wood. A small piece of fatwood can be used many times to create tinder by shaving small curls and using them to light other larger tinder. 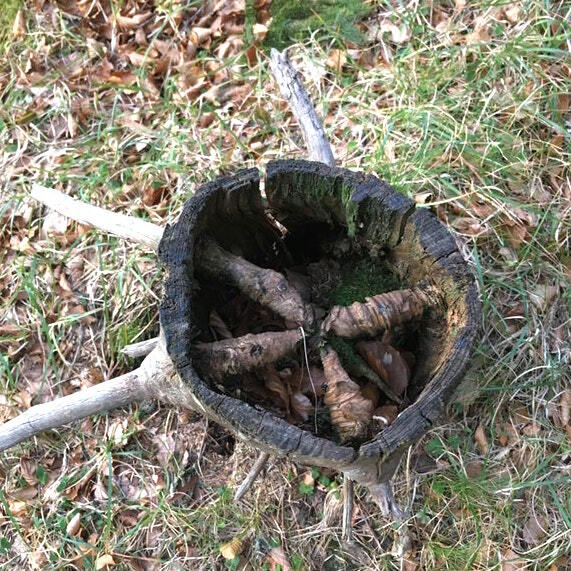 The pitch-soaked wood produces an oily, sooty smoke, and it is recommended that one should not cook on a fire until all the fatwood has completely burned out. Sapwood (or alburnum) is the younger, outermost wood; in the growing tree it is living wood, and its principal functions are to conduct water from the roots to the leaves and to store up and give back according to the season the reserves prepared in the leaves. However, by the time they become competent to conduct water, all xylem tracheids and vessels have lost their cytoplasm and the cells are therefore functionally dead. 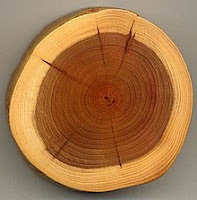 All wood in a tree is first formed as sapwood. The more leaves a tree bears and the more vigorous its growth, the larger the volume of sapwood required. One of the pleasant memories of my childhood in Minnesota is of searching through the woods with my mother looking for pine knots to put in the fireplace. We used them to add a pleasant odor to the cabin, not for kindling per se. Lots more things you wouldn't know at the heartwood link. Photo (cropped for size) via the Mildly Interesting subreddit. In some parts of the south, we call it a (very slightly) different name: FATTY LIGHTER. In Florida, we had a significant turpentine industry back in, I think, the early 1900s. Back in, I suppose the 1970s, a rural fellow told me that fatty lighter, placed in a jug of water, then drank, was beneficial for high blood pressure. I don't know about that. It might be true, but I could take to the taste long enough to see any results, I reckon. My uncle showed me about the fatwood when I was a boy. I dont remember what he called it, but i was fascinated, watching it burn.